The Bluegrass Buckaroo - Tom Feller and Chris Hill are finishing up their first CD. The duo is projecting a release date of June 2012 for the first Feller and Hill and the Bluegrass Buckaroo project. 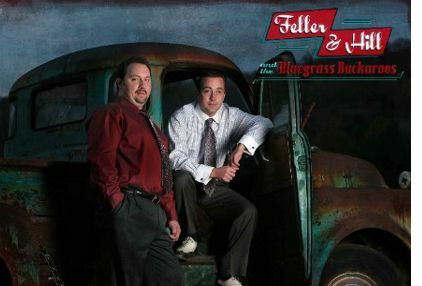 The exciting duo, Feller and Hill began booking and touring with their Bluegrass Buckaroos in January, 2012. If you like traditional bluegrass and classic country music, you'll love Feller and Hill and the Bluegrass Buckaroo. Tom Feller and Chris Hill were born across the Ohio River from each other—Tom in southern Indiana and Chris in northern Kentucky. Both have performed with bands from bluegrass-rich areas of Indiana, Kentucky, Ohio, and Virginia—Tom with Jerry Williamson & Redwing, The Larry Stephenson Band, Rhonda Vincent and the Rage, and with Nashville songwriter Kim Fox in the group 3 Fox Drive... Chris with Gerald Evans and Paradise, The Wildwood Valley Boys, the James King Band, and The Karl Shiflett and Big Country Show. "Bluegrass-bound" to get together someday—it happened when Tom was filling in on bass and running sound with his cousin, Tony Holt's band, the Wildwood Valley Boys, during Chris Hill's tenure with them. Tom immediately noticed Chris's Don Rich-like tenor abilities, filing them in his best in the business category. Likewise, Chris admired Tom's skills at bass and sound engineering. Tom learned to run sound from his mentor/Grandpa, Anthony Holt, and is considered today to be one of the top sound engineers in bluegrass music. Chris learned his own sideline—clogging, from his mentor/Uncle, Glenn. Excelling in competitions, Chris was twice named National Champion. His career took him to Japan, the stage of the Grand Ole Opry, (Tom's Opry stage debut was with Rhonda Vincent and the Rage), and through the urging of George Jones, successful engagements on Norwegian Cruise Lines. Both Tom and Chris became talented multi-instrumentalists. On banjo, Chris is equally comfortable playing straight-ahead Scruggs, Reno, or Stanley style, giving him an edge over many other banjo players on the bluegrass circuit. In the ‘90's and beyond, Tom's lead guitar rocked Cincinnati country radio in his and brother Joe's group Quartermile, when they were three-time winners of station B-105's Battle of the Bands. In August of 2010, Tom and Chris went into the studio to record a demo CD. They soon found that their respective tones easily merged to create those magical hair-raising harmony moments. Tom had a hunch that the sound of he and Chris passing lead vocals back and forth, while alternating harmonies, would turn a few heads. It did just that.